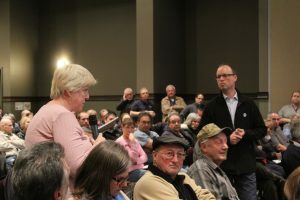 Volkswagen Chatham held an information session at the John D. Bradley Convention Centre in Chatham Tuesday night, to discuss what many referred to as an “emissions scandal,” affecting 2.0L Turbocharged Direct-Injection (TDI) vehicles. Nathan Jenner, general manager at the Chatham dealership, spearheaded the presentation by going over options. The option to opt-out is no longer available as the deadline was set earlier this month. However, options currently available to those affected include a buyback/early lease termination or buyback with trade option. There is an alternate option which involves getting an emissions modification done for those who purchased a vehicle after September 18, 2015, however, that depends on whether or not the modification is approved by the EPA. In terms of a settlement timeline — there isn’t one. A court hearing regarding settlement approval in Ontario is slated for March 31, 2017. Depending on what’s decided in the courts, Jenner says timelines may become a little clearer. During the questions period, attendees expressed their frustration with the lack of incentives Volkswagen is offering and the fact that the amount of money customers might get back depends on the current mileage left on their vehicles — not the mileage the vehicles had when they were first purchased. Some people left the room mid way through the question period shaking their heads. However, as stated by one attendee, the frustration is directed at the Volkswagen company not the local dealership. Since news of the scandal broke, Jenner says the dealership has noticed a decline in sales. “It’s hurt our business and Volkswagen is down as well,” he says. One Volkswagen owner, Janice LeBoeuf, says she’s frustrated that the Canadian settlement has taken so long when compared with the United States. As stated during the information session, customers affected don’t necessarily need decide what route to take until the end of June 2018.